I was intrigued by the premise of this novel, a travel agency which sells vacations in time to wealthy clients. Tour guide John Surrey, an ex-LAPD cop, becomes the first man to travel in time. His first assignment is to test the age old paradox, can time travel alter history. His goal - get a bit part in a 1940’s Hollywood movie. If he shows up on film in present day, history can be changed. Surrey’s trip to 1940 Hollywood finds him socializing with John Wayne and Humphrey Bogart, while being embroiled in World War II espionage with the likes of James Bond author Ian Fleming and spy William Stephenson (a.k.a. Intrepid). John also manages to find time to make side trips to visit Jim Morrison and the Doors at the Whiskey A Go-Go circa 1966, 1957 Hollywood and a 1978 Disco in Hermosa Beach California. I found Timeshare refreshing and disappointing at the same time. 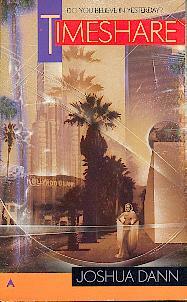 While the author obviously had fun setting the story in Hollywood of yesterday with characters the reader would immediately recognize and relate to, his choice of a plot was confusing. What starts out as a novel of exploration -- what does it mean to travel in time -- turns into a mystery novel for all of five seconds before degenerating into a Harlequin Romance novel. A for effort and a C- for execution. I am not sure whether it's a case where the author was trying to be too many things to too many people or whether I as a reader was going into to the novel with one set of expections, only to discover the author had intended another type of story. My hope is that since this is Dann’s first novel in the series and that we may see better work to come. All in all Timeshare is well worth the look. Andy Anachronisms' review of the second novel in Dann's Timeshare series.